From Bangkok to Vientiane by train you must first travel to Nong Khai in Thailand. 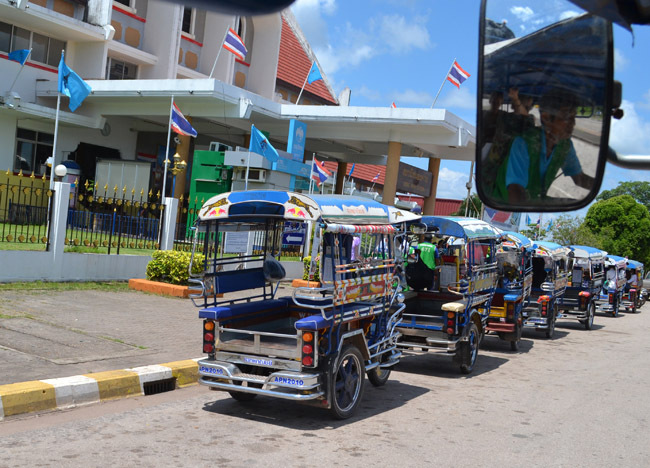 From Nong Khai you then cross the Thai / Laos border at Friendship Bridge and forward on to Vientiane by tuk-tuk or minivan. Reaching Nong Khai the easiest route to take is tuk-tuk from the Nong Khai train station to the border for Laos (20baht). After crossing the border a further minivan ride will bring you to Laos capital Vientiane (50baht). Routes are well established and inexpensive. For details on VISA on arrival and the border crossing at Friendship Bridge check detailed here. 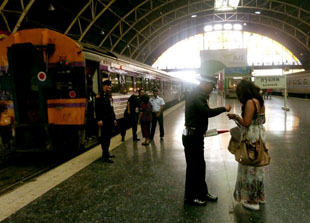 Three trains leave Bangkok’s Hua Lamphong Station to Nong Khai each day (North East Line). All trains leave in the evening and travel overnight. Journey time takes roughly 12 hours. Nong Khai is the final station on the North East Line so don’t worry about missing your stop. For online booking check here. Below image is from the online booking site. The 133 ‘rapid’ train appears to be discontinued? Prices as below. Include a small booking fee. Lower berth 2nd Class Aircon advised. Non-Aircon seat not advised. We took the train from Bangkok to Nong Khai in September 2012. We booked online, printed the ticket (PDF) and travelled on the 20:00 train in 2nd class sleepers. Booking last minute had only lower berth tickets available. We arrived at Nong Khai 3 hours late. Not sure if this is the norm… but best not hold a tight schedule. 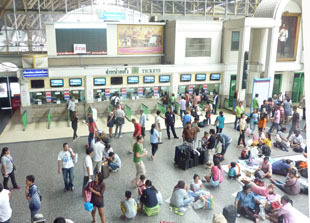 Leaving Hua Lamphong Station – Bangkok Train Station can be easily found by taxi or using the MRT (Hua Lamphong stop). 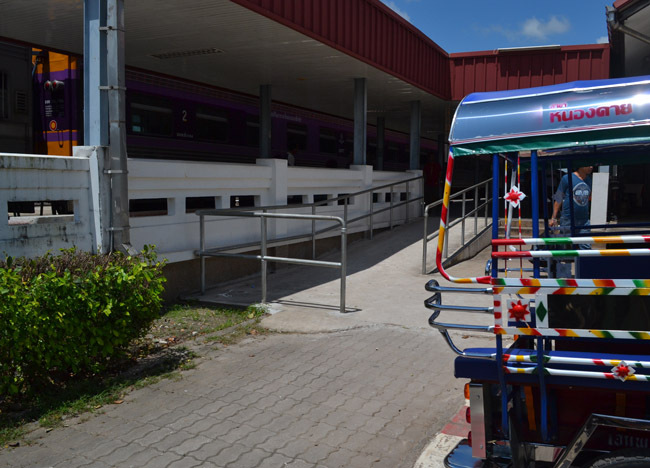 The station has a large area for purchasing tickets, food court, waiting, book store etc. Train announcements are made on loud speakers in Thai. If you don’t understand Thai check your train number and wait at the platform area. Ask stewards if necessary. During the day the sleeper beds are hidden away and individual seating is provided. Plenty of room and comfortable. The seats have space underneath to hide larger baggage, backpack, suitcases etc. 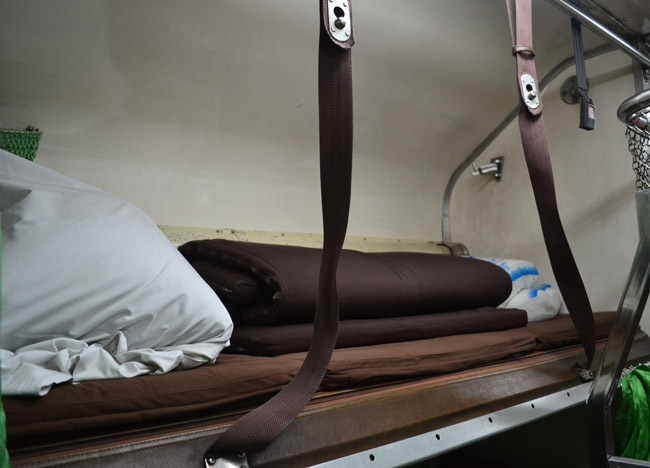 If you plan on sleeping early ask the on-board steward to set-up the sleeper beds. You can do this almost immediately after leaving Bangkok to Nong Khai. You can buy food from the Bogie restaurant at the end of the train. The food is cheap with sets all priced under 200 baht and consist of 3 mains and fruit. Most people order snacks to their seats as waiters do a tour of the train. This is the same for breakfast in the morning. The restaurant closes at around 10pm and opens early. When needed ask the train steward to set up your sleeper beds. One bed is pulled down from the roof while the second is made from the seats below. Both top and bottom berths have curtains for privacy. The lower berth has enough space to fit two people and has a window to watch the night go by. The lower berth does get warm as it is cut off from air-con. 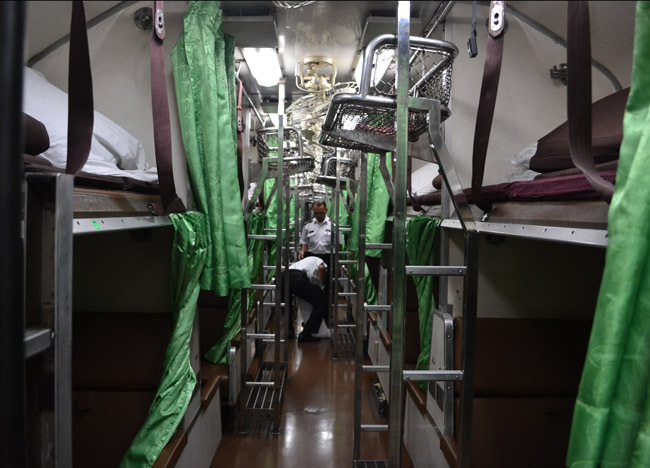 The upper berth may also get cold being too close to the air-con. The upper berth is smaller and slightly cramped. It can be quite hard to sleep with the sound of rickety rails, hooting horns and the occasional passerby. 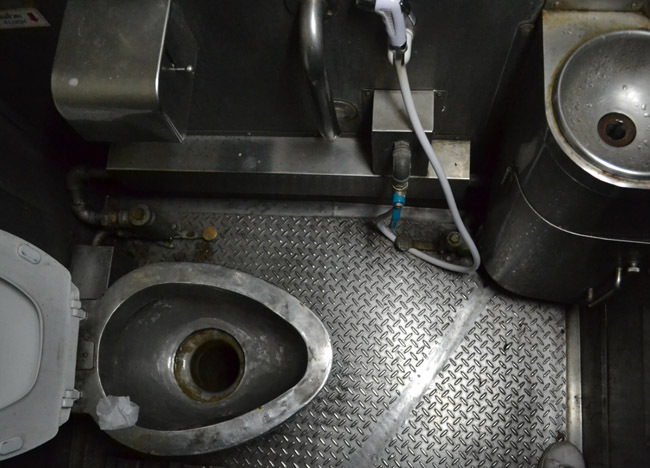 At the end of each passenger car there is an open washroom and a toilet. 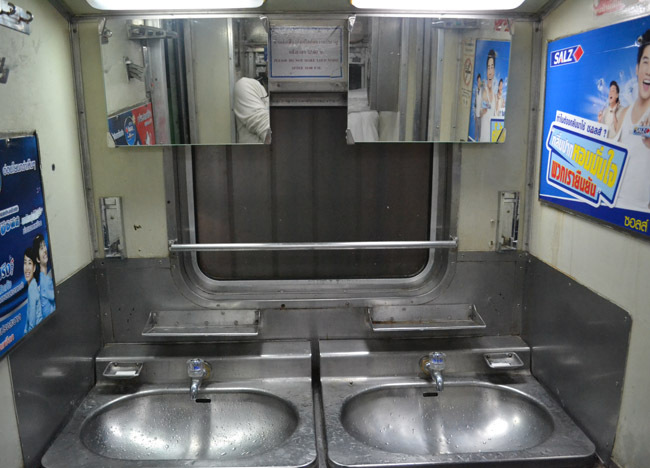 The washroom provides sinks, mirrors, tissues, soap etc. The toilets can be different in each car. One may have a squat toilet while another may have a western toilet. Just walk to the next car if you don’t fancy the squat toilet. Sorry to hear that. Chiang Mai is infinitely the better. Well worth the visit if the time is available. I’ve been on the overnight Chiang Mai train before. Strangely therapeutic and so much better than the buses North. How many days did you stay in Lao’s for? Did you go to for tubing? I am in Shanghai right now and I will be in Thailand in July. I am planning on going to Lao’s from Bangkok, probably 3rd of july then go back to Bangkok. Any suggestions? Hi Sufia, Living in Bangkok means Vientiane, Laos is my closest border to pick up Thai VISAs. I tend to travel around on each visit. If planning to go tubing be sure to check the current situation. Recently there was a crack down on the boozy Viang Vieng scene including tubing businesses and riverside bars being closed. Unsure how many survived (if any). You can bus from Vientiane to Viang Vieng and onto Luang Prabang (a must). Not far but bumpy roads means a good few hours travel. Travel easily arranged in Vientiane. Check my Vientiane blogs for info. For Bangkok check my Bangkok website 🙂 http://www.boutiquebangkok.com/ Have a good one.